This 53 note calliaphone / calliope makes a wonderful, if loud, addition to our collection of musical instruments. Annecdotal evidence suggests that it was built in 1988 by the Miner Manufacturing Company of Donnellson, Iowa and spent time in Oklahoma before venturing west in 2008. The same instrument is still built today by the Miner Company of West Point, Iowa. Looking at the back you can see the roll player through the (open) door. 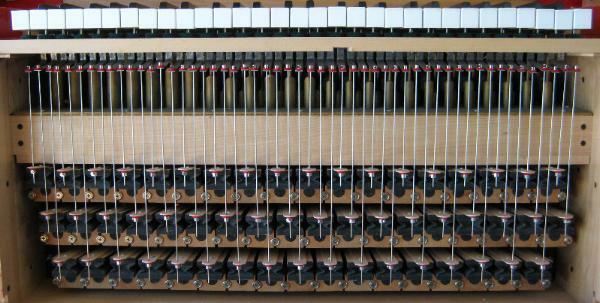 Above that are the 4 tiers of whistles, one for each key on the keyboard. Note the keyboard. 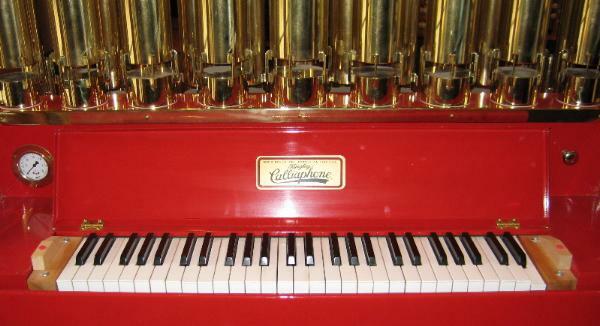 There are 53 keys beginning with the equivalent of the 'C' below 'Middle-C' on a piano keyboard. ( 4' C if you are an organist). 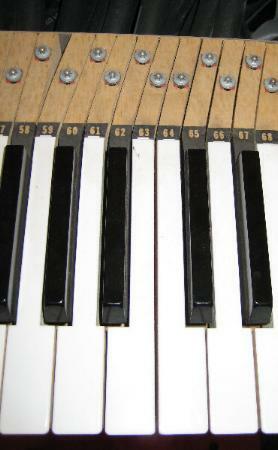 Above and to the right of the keyboard is the knob that engages the roll player. Above and to the left is the pressure gauge. The pressure fluctuates as the keys are played and the change in pressure causes a shift in the pitch of the pipe. This gives the air calliaphone a characteristic sound. The pressure varies based on the number of whistles playing at any one time. With the keyboard cover removed you can see that the tails of the keys are slanted. It appears that a set of piano keys was shortened for use in this instrument. The data plate with serial number. A surprisingly large number of these machines have been built over the years. According to Dr. Bill Black on the Carousels website Norman Baker founded the Tangley Calliope Company in 1914 in Muscatine, Iowa. The company produced a machine sold under the name Tangley Air Calliope and was later called a Calliaphone. The player uses 'A Rolls'. The typical A Roll contains 10 different tunes. 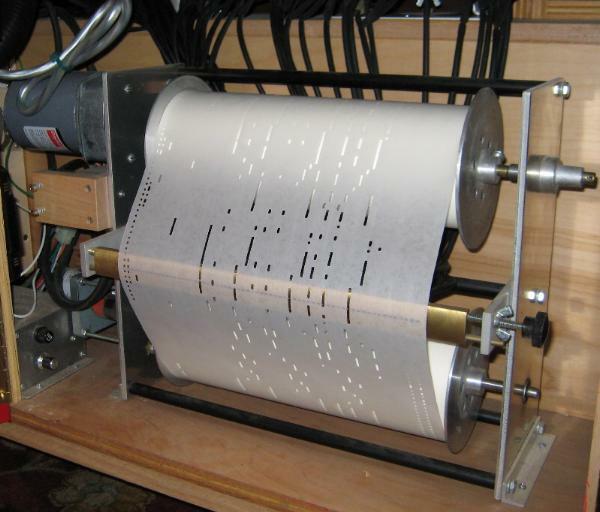 An A Roll 'tracker bar' (the device (brass bar in the photo) that the holes in the paper rolls pass over) has 65 holes of which 58 actually correspond to notes on the keyboard. The other seven holes are used for detecting the end of a song or the end of the roll, or for turning on additional instruments, etc. (A Rolls are commonly used on Nickelodeon player pianos which often have xylophones or a rank of pipes that play along with the piano). Under the keyboard is the array (or 'stack') of pneumatics that pull down on the keys. 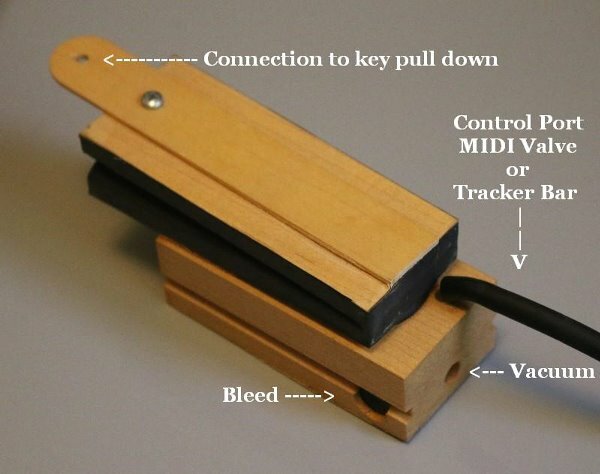 As a hole in the paper roll passes over the tracker bar, the pneumatic for the corresponding note collapses and pulls down on a rod (or 'sticker') attached to the bottom a a key. 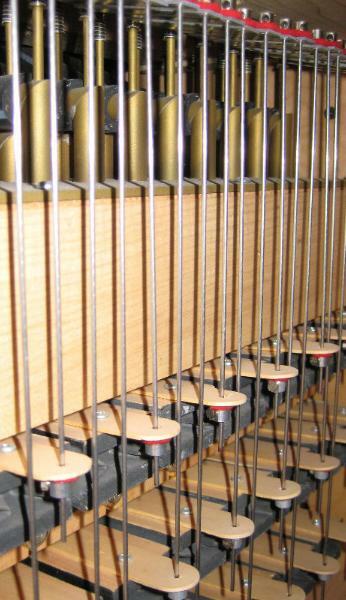 In the photo above you can just see the valves (bronze colored) under the keys that admit air to the tubes connected to the whistles when a key is depressed or pulled down by a pneumatic. The area between the stack and the valves is the air chamber that is pressurized by the blower. Here's a shot of the pneumatic and valve removed from the calliope. 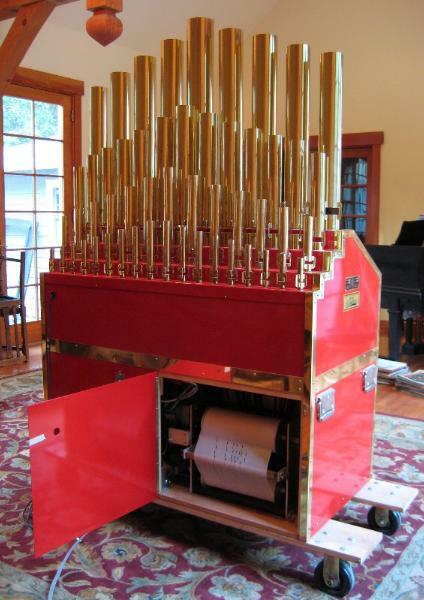 This calliope can also be played via MIDI. While a single A Roll contains 10 songs, a MIDI player the size of a deck of cards containing an SD chip can hold thousands of songs. 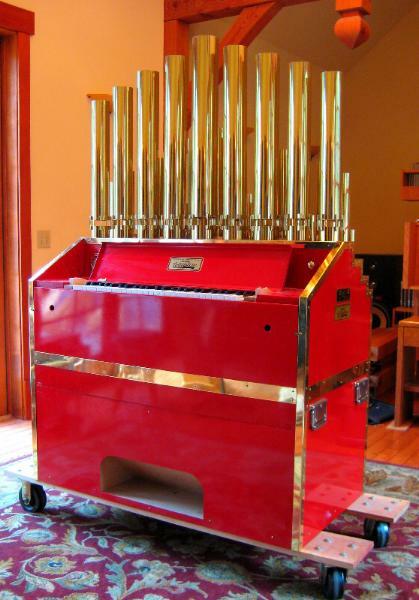 There is a lot of music that sounds really good on this calliope that is unavailable on A Rolls. Dutch Band Organ music in particular sounds very convincing. 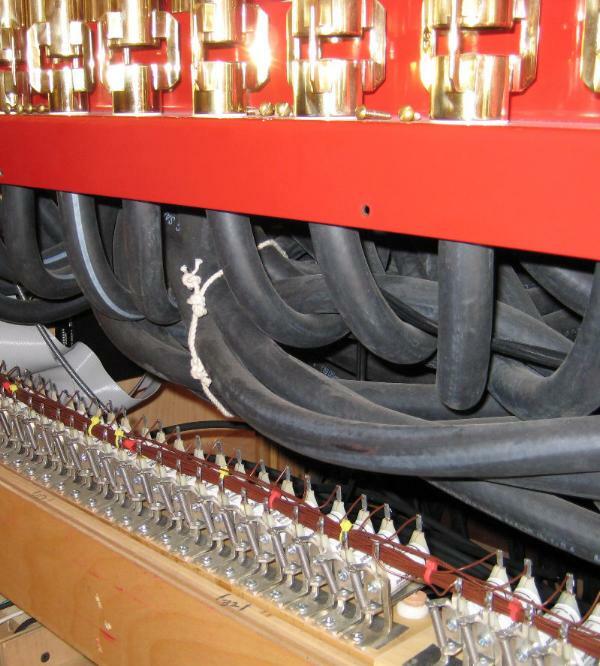 The mechanical aspect of the MIDI control is handled by 53 Peterson All-Electric Pipe Valves. Each pipe valve covers the end of a tube that is tee'd into one of the tubes from the tracker bar. When the pipe valve is energized, an electro-magnet raises the pallet and allows air into the tube just as if a hole in the paper roll had passed over the tracker bar. 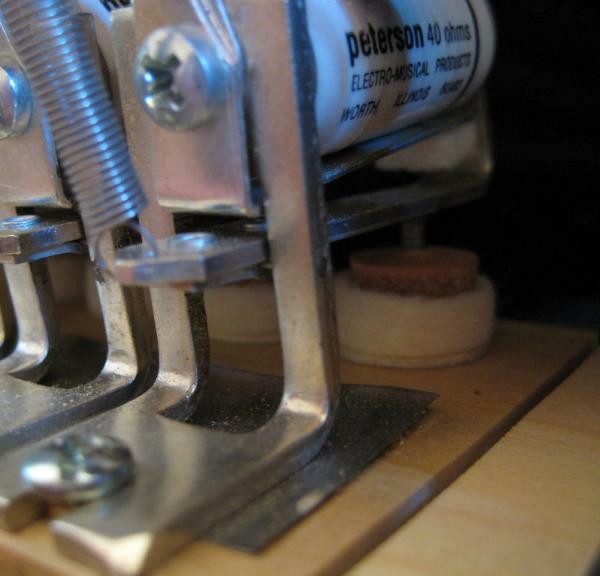 When the MIDI player is in operation, the roll player is stopped with the A Roll covering all the holes on the tracker bar. The conversion of the MIDI serial datastream into individual contact closures is handled by an Octet Designs UM-1. This unit is no longer manufactured but information on it can be found on the Mechanical Musical Digest website.